In scenarios menu we have only tutorials, untold battles, second war and custom missions. Would be great to add scenarios from all DLC to replay them, but i think this suggestion is not for community update. Do you want to create subfolders in save screen on your own or do you want to see pre-created folders? deranzo wrote: Do you want to create subfolders in save screen on your own or do you want to see pre-created folders? By the way, have you seen any other bug as briefing screen bug? is it possible, that in your mod the cadians are a usable imperial faction? not existing modding skills, i can not activate / use them. Anyway, thank you for your work! This is a realy good game and I am happy to see, that someone develops it further!! stroganoff wrote: is it possible, that in your mod the cadians are a usable imperial faction? Yes, in my mod, its possible. As additional units to Steel Legion, not as an specific faction. Because I don't modify source code in my mod. You can see them in Steel Legion faction in future update. In fact, I have Necrons and Chaos units ready but haven't added to my mod yet. But definetly I will in the future. 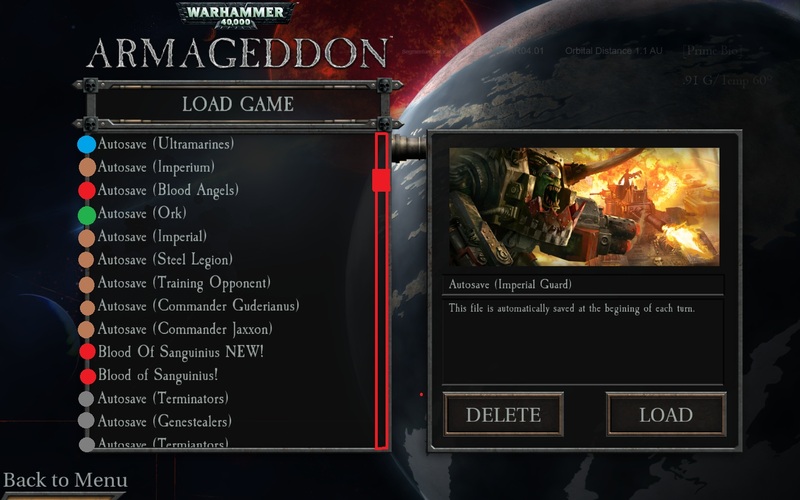 And even I can add tyranids and tau units, sounds, animations to my mod from an another existing good mod if I can contact the creater and take permission from him/her. But we can't create any separate faction/race/units in future updates for official game for now. But if situation changes I will be the first one who announces this to you guys! And thank you! Send feedback about my mod in related topic to that in mods forum please. "- AA weapons affect related units much more. For example you can see flyer units can't evade AA weapons anymore." Is the Flyer-trait working as intended? A problem with flyers is that they are killed rather easily by any weapon. Makes me wonder if evade is working at all or if the chance is too low..? 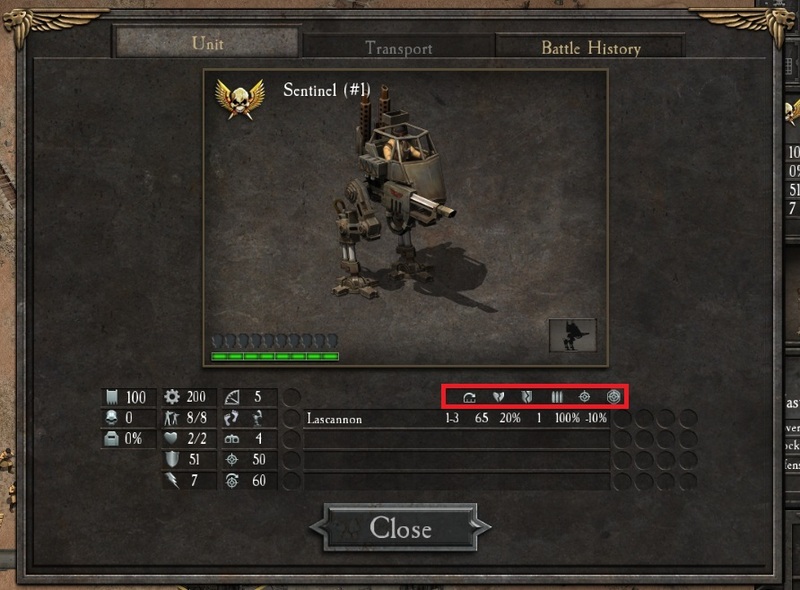 Camo is a unit trait that works (makes the unit invisible as long as it's not adjacent to an enemy unit) but it lacks an icon in the unit info panel. Could you add it? A very minor 'bug' I noticed is that the transport name will show up in the experience bar, if the transport is carrying troops. It's a result of the changes you made to the UI to make room for the 4th weapon slot. Can you make changes to the editor? I got a campaign I was working on years ago. I'll try to piece it together during the weekend and post it here. Keep up the good work, deranzo! - Killing flyer units easily depends on health and armor. Due to their health and armor is low, you are correct. You can change those in unit editor. But I have meant weapons with AA trait now has 100% accuracy against flyer units. - Unit details GUI needs code modify, I can do that in future updates. - Oh its good you to say that transport issue. It's a GUI screen bug-like issue. I can do that without modifying source code and needing update. - For example what do you want in editor? Didn't know this before. Thanks for mentioning. i repeat in this topic my suggestion of adding a pair of "tank" and "anti-tank" traits wich affects the accuracy of anti-armor weapons against tanks and titans. also, when you load any map of the main campaign and buy units, the units have a "base" experience, but it doen't work in the main campaign when you carry your force between scenarios. the final scenario has a base experience of 800. my suggestion it's that when you purchase new units, they should have the base experience of the map. or half that number, if the balance is affected. when you reinforce a unit the reinforcements come with the experience of the map instead of 50% the experience of the unit. i don't know the formula, but the effect should be that in the first maps the reinforcements are green and you lose experience more quickly. and in the final maps the reinforcements are experimented and you can even gain experience when reinforcing a unit with low experience. the current system is always 50% of something. deranzo wrote: By the way, have you seen any other bug as briefing screen bug? Is there an easier way to mod unit availability, or is it possible to add an easy way to do this? I remember this thread: http://www.slitherine.com/forum/viewtop ... 26&t=54819 has users mentioning problems related to this, but I'm not sure what the current situation is. It would be cool if this could be made easier (or possible at all, if it isn't yet) in a coming patch/update. You don't need an update to do that actually. You can find unit availabilities in availxxx.whdat files in data folder. There aren't specific files for each mission but as mission segments. First, you must find related unit id in unit editor at scenerio editor. Its seen at top of the menu when you select a unit in unit editor. After finding it, open any availxxx.whdat file with a text editor or excel and add that unit id at the bottom of the file. You can have any unit in any mission by this. Its very easy after doing once and make it work. Oh I see. Thanks for the hint. Several scns have objective/mission changes, but the game still does display the original, outdated objectives when clicking the "i" button in the lower right corner. Also, there does not seem to be a "log" function that allows you to view the info from previous text popups. Such a log was added to the later versions of Panzer Corps (which I understand WH is based on), so could it be implemented here too? That way player could re-read earlier text popups. In case you get new objectives this would be very helpful IMO.